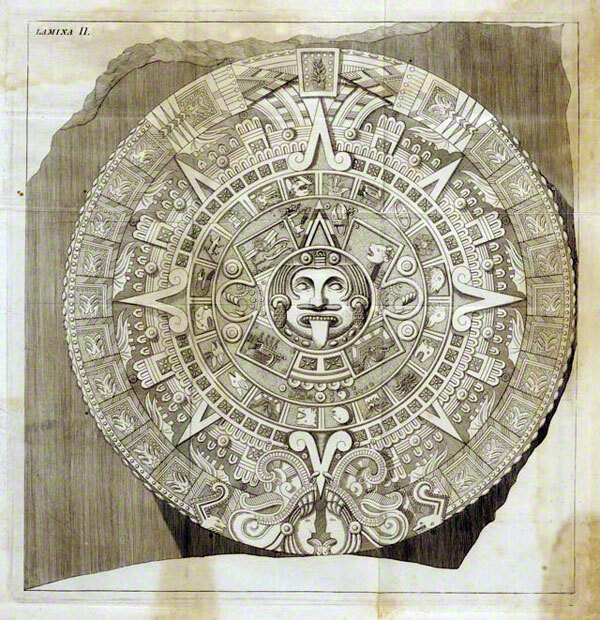 The Aztec Calendar Stone, or Sun Stone, as it is called in Mexico, is perhaps the most famous sculpture made in the Americas before the arrival of Europeans at the end of the fifteenth century. Although earlier scholars thought that the stone was carved in the 1470s, during the reign of the Aztec emperor Axayacatl, most writers today believe Moctezuma Xocoyotzin commissioned the Calendar Stone sometime between 1502 and the conquest of Mexico in 1521. 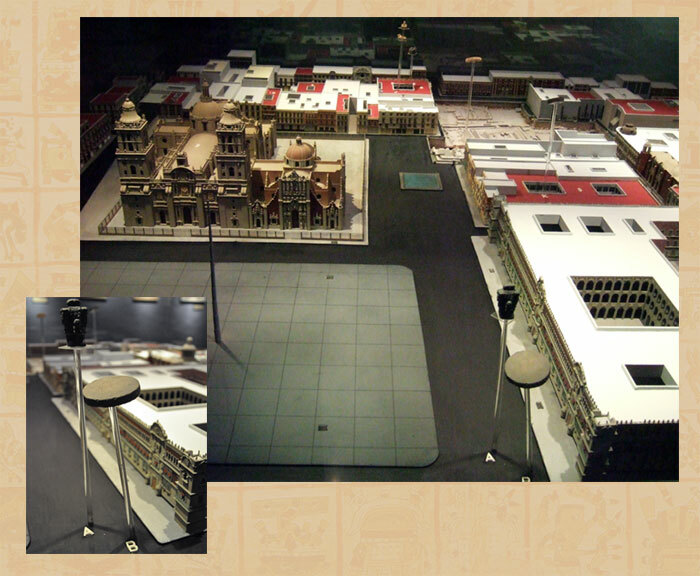 We do not know where the sculpture was originally placed in the Aztec capital of Tenochtitlan, but presumably it was situated close to the Templo Mayor. After the defeat of the Aztec, the Spanish tried to demolish, destroy, or bury the Aztec temples and monuments in the former capital because they were thought to be too closely linked to Pre-Columbian pagan religious beliefs and practices. For some reason the Calendar Stone seems to have been left unburied, since the Dominican friar Diego Durán recalled seeing a sculpture lying in the Zócalo, or main square of Mexico City, that from his description was almost certainly the Calendar Stone. Durán noted that the monument was later buried by Archbishop Alonso de Montúfar (probably at the end of the 1550s), on account of the murders and other offenses that were committed upon it. 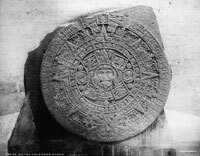 The Calendar Stone was rediscovered in December 1790, in the course of a leveling project in the Zócalo. The massive basalt slab, measuring 11½ feet in diameter and weighing more than 24 tons, had been buried less than three feet beneath the surface, with its sculptured face down. 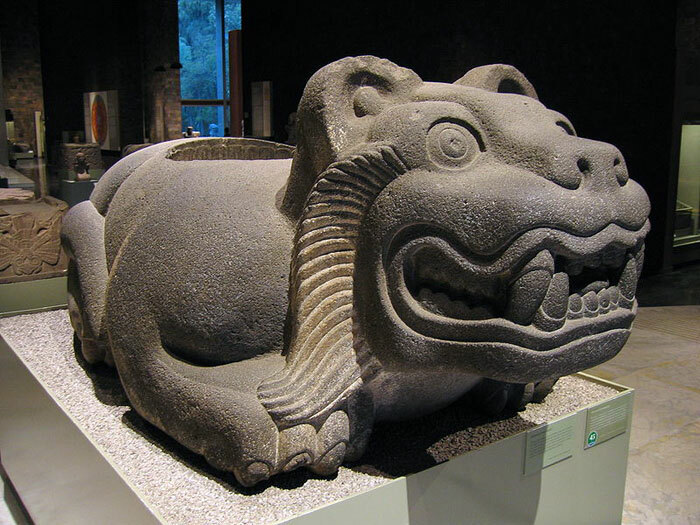 The Calendar Stone was one of three large Aztec sculptures rediscovered in 1790 and 1791, along with the famous Coatlicue goddess statue and the Stone of Tizoc. Apparently the Spanish Colonial and Catholic Church authorities planned to use the Calendar Stone as a step in front of the cathedral in the Zócalo, not only keeping parishioners’ feet out of the mud, but also as a symbolic statement of the triumph of Christianity over pagan Aztec religion. In 1882, the sculpture was moved a couple blocks on special train tracks constructed for the purpose to the new Museo Nacional on Calle Moneda, on the north side of the national palace. It was installed in the Salón de Monolitos at the museum in 1885, and remained there until 1964, when it was moved to the Museo Nacional de Antropología. 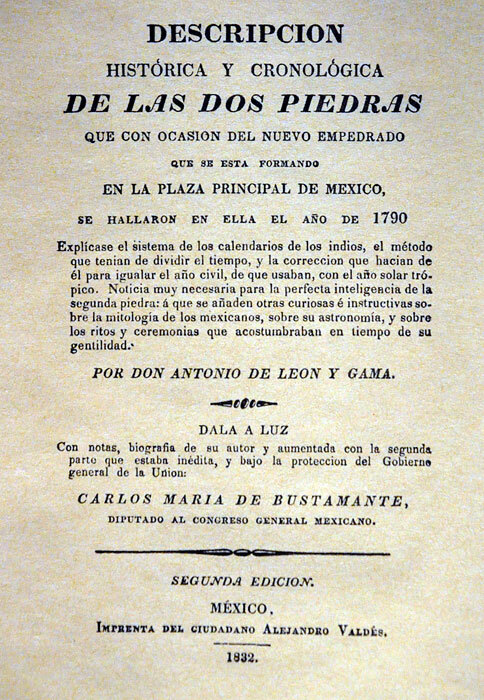 León y Gama published the first scholarly discussion of the Calendar Stone in Mexico City in 1792. 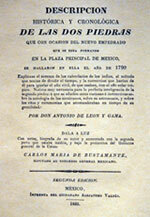 His Descripción histórica y cronológica de las dos piedras que con ocasión del nuevo empedrado que se esta formando en la plaza principal de México, se hallaron en ella el año de 1790. [Historical and Chronological Description of the Two Stones that were Discovered in 1790 in the Main Square of Mexico City] presented his description and interpretation of the Calendar Stone and the Coatlicue goddess statue, with the first images of both works, engravings by the artist Francisco de Agüera. León y Gama thought the Calendar Stone functioned as a great sundial, and that along with an identical sculpture marked the solstices, equinoxes, and zenith passages by shadows cast by strings and gnomons set into the stones. One stone marked the events of each half of the year. From this time forward, the stone was erroneously thought to be a timekeeping device. In the 1870s, the Mexican archaeologist and statesman Alfredo Chavero proposed that the Calendar Stone was not a timekeeping device, but rather a sacrificial altar of the kind the Aztecs, or Mexica called a cuauhxicalli, or eagle sacrificial vessel. While some of these vessels are carved as basins, and others are round discoidal altars, all were intended for sacrificial offerings. Captives were sacrificed on them or their hearts and blood were placed in them. The image carved on the Calendar Stone shows a face surrounded by a series of concentric rings. The figure at the center has been identified as either the sun deity Tonatiuh, the earth god Tlaltecuhtli, or some hybrid of the two. The Aztecs believed that they had been ordained by the gods to keep the sun moving across the sky by feeding it with the hearts and blood of warriors. The earth also required similar sacrifices. The claws we can see to the right and left of the central face (see pic 9) probably originally grasped human hearts, today much eroded or damaged. 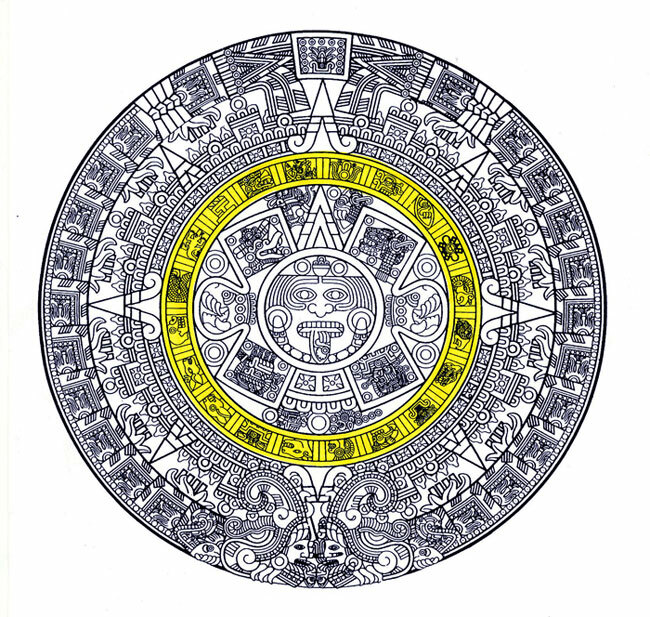 The central face and the X-like form around it together present the Aztec hieroglyphs for the five successive creations of the world, from the earliest to the present (or at least the present in 1500). 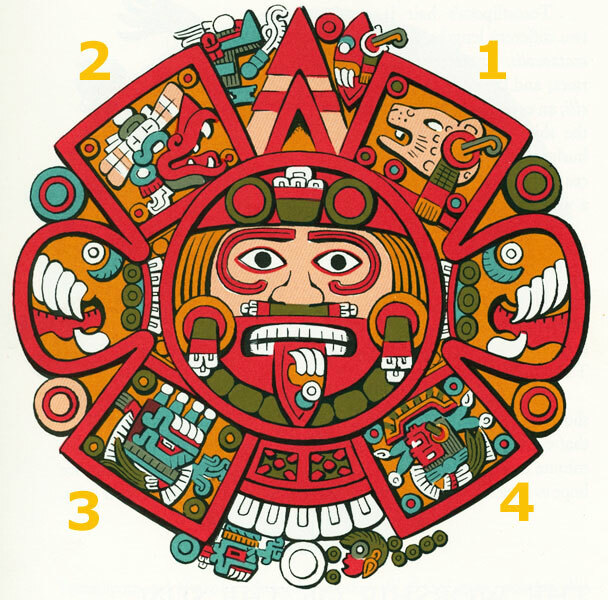 The first creation, or Sun, as the Aztecs called them, is shown in the box to the upper right of the central face, and was named Nahui Ocelotl, 4 Jaguar, for the day in the Aztec 260 day calendar on which it ended. 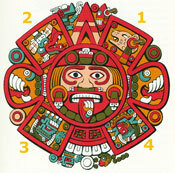 Continuing counterclockwise, with the upper left box, the next creation was Nahui Ehecatl, or 4 Wind. Then at lower left, Nahui Quiahuitl, 4 Rain, and at lower right, Nahui Atl, or 4 Water. The Jaguar Sun was destroyed by giant jaguars; the Wind Sun by terrible hurricanes; the Rain Sun by a rain of fire; and the Water Sun by a great flood. The X-shape and the four dots above and below the claws are the hieroglyph for Nahui Ollin, 4 Motion or 4 Earthquake. 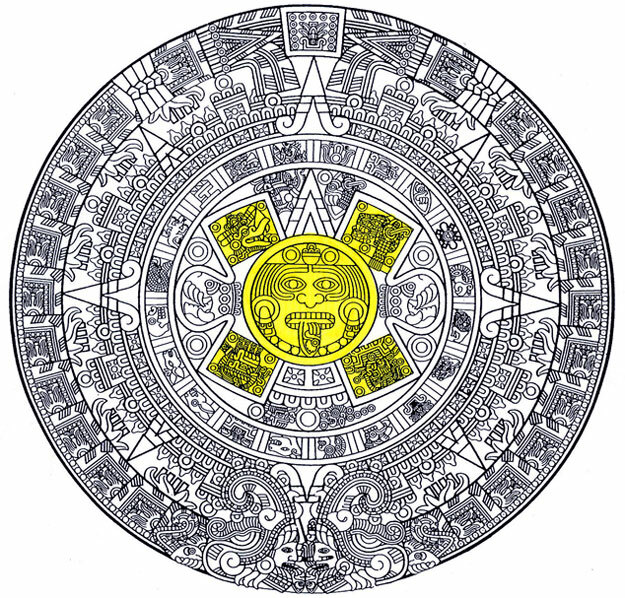 This was the so-called Fifth Sun, in which the Aztecs lived, and which was supposed to be destroyed at some unknown time by earthquakes. Any date in this Aztec calendar, such as 4 Ollin, repeated every 260 days. 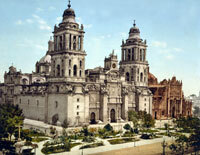 So it is impossible to say when the Aztecs thought the present creation might end. They lived with the constant threat of destruction. It is important to recall that the creations, their names, and sequence on the Calendar Stone were devised by Moctezuma and the Aztecs. They are essentially unrelated to the sequences of world creations and destructions used by other peoples of ancient Mexico and Central America. 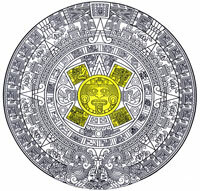 In particular, the Aztec Calendar Stone has nothing to do with the ancient Maya calendar that is supposed to be ending at the close of 2012 (it is not ending!). The first ring of images around the central medallion of the Calendar Stone contains the twenty days of the 260 day calendar, which the Aztecs called the tonalpohualli, or day count. This calendar, which was probably originally associated with the Moon, works by combining the twenty named days with thirteen numbers, yielding 260 combinations. But the Calendar Stone has no numbers associated with the named days, so it cannot be used to tell the date. The presence of these days led earlier writers to imagine that the Calendar Stone was a timekeeping device. 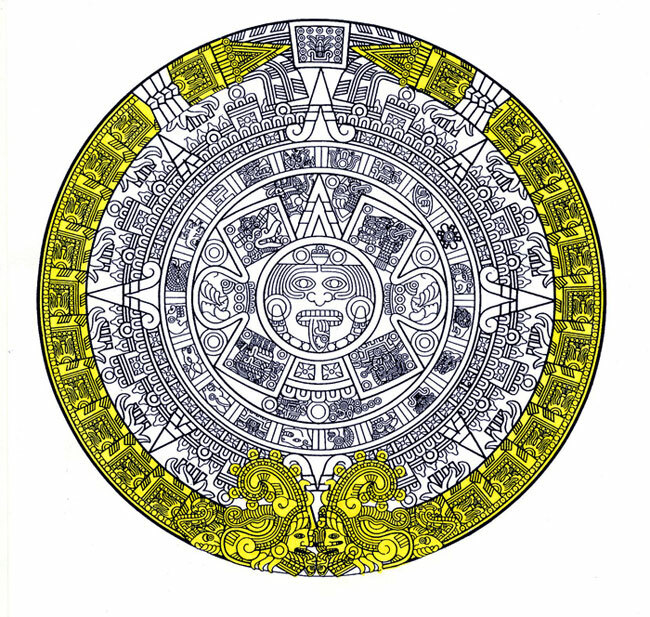 The days begin directly above the center face, with the day cipactli, or crocodile, and proceed counterclockwise, until reaching the last day, xochitl, or flower, just to the right of the first day. The next ring contains a large number of small boxes, each with a five-part symbol like the number five on a playing dice, that has been interpreted as the sign for turquoise, a stone ancient Mexicans associated with preciousness and fire. This ring is punctuated by a series of points that symbolize the rays of the sun. Between these rays we can a large number of upside down U-shaped forms, symbols of feathers, and above them many triangular pointed forms, which some writers interpret as drops of blood. These are interrupted by six taller rectangles, each with feathers and one of the five-part turquoise hieroglyphs. Felipe Solís and Eduardo Matos Moctezuma have interpreted these as the handles of ceremonial perforators, intended to draw blood for the sacrificial offerings that fed the gods and ancestors. The outermost ring of the Calendar Stone is composed of two great dragons, the Xiuhcoatl, Turquoise or Fire Serpent, which probably symbolize the blue sky vault. The serpents have flames on their backs, and they meet snout to snout below the central face. Their noses bend backwards, and are decorated with star symbols. 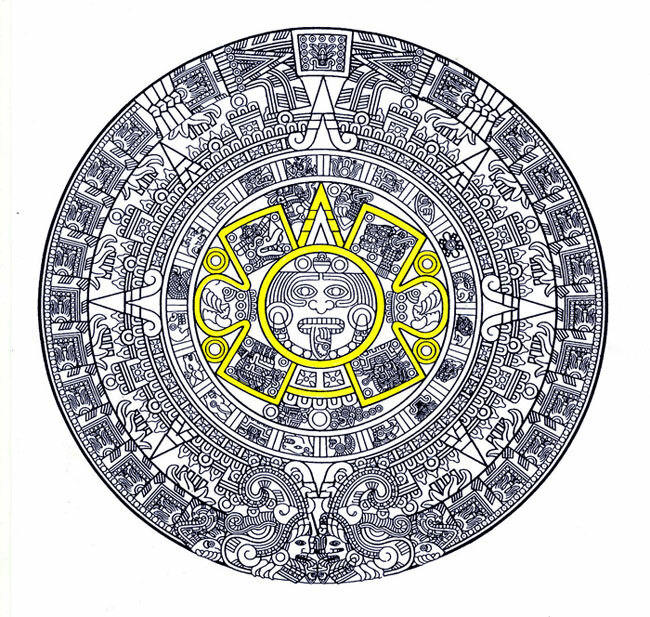 In their open mouths appear, as if from the supernatural world, the faces of the sun god Tonatiuh, and the fire god, Xiuhtecuhtli. Since its rediscovery, the Calendar Stone has been displayed vertically, as if it really were a clock. But the form and imagery of the sculpture closely link it to sacrificial altars, upon which the Aztec emperor, probably Moctezuma himself, ascended to sacrifice noble captives to feed the sun and earth. The most closely related monuments to the Calendar Stone are the Stone of Tizoc and the Stone of Moctezuma I. Both are large basalt disks, with solar imagery on their upper faces. 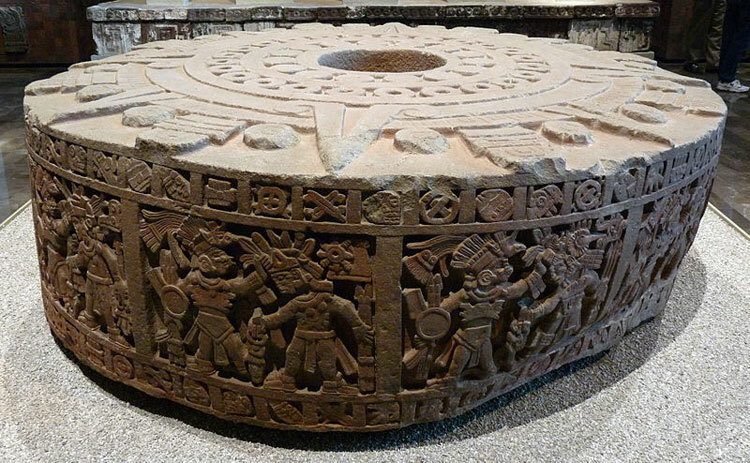 But whereas these other monuments display the conquests of Aztec rulers on the sides of their cylindrical forms, the Calendar Stone shows images related to the sky on its shallow carved side (see link below). We do not know why the Calendar Stone was not completely carved into a cylindrical block. In the 1920s, the German writer Hermann Beyer suggested that the stone broke, and they had to carve a much shallower disc than originally intended. 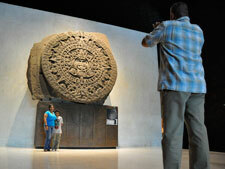 Most large scale Aztec sculptures were carved in the round, in ways that suggest that they could be moved. The Calendar Stone has a large irregular stone flange that suggests it was permanently mounted on a platform. • Solís, Felipe. ‘La Piedra del Sol’, Arqueología Mexicana 7(41):32-39. Enero-Febrero 2000 (in Spanish). • Villela, Khristaan D., and Mary Ellen Miller (eds.) The Aztec Calendar Stone. Getty Publications, Los Angeles, 2010. • Pix 10-14: graphics by Phillip Mursell, based on line illustration of the Sunstone by - and courtesy of - Tomás Filsinger. A Yr-6 girl at Holy Trinity CE Primary School, Woking, described the Sunstone, during one of our Aztecs workshops, as ‘an infinite jigsaw puzzle’. We love it! 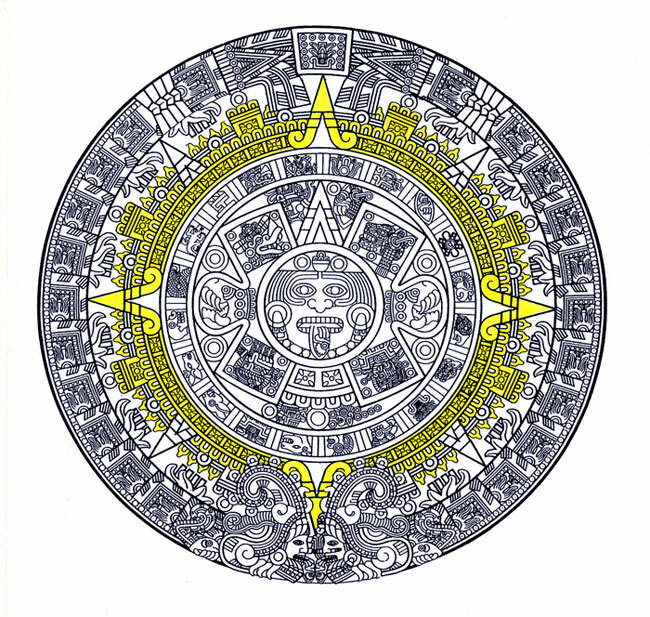 Is there any evidence that supports the theory Spanish soldiers or Tlaxcaltecan soldiers under Spanish Frair orders used the stone to sacrifice Mexica Male and Female Astronomers prisoners of the Quetzalcoatl order? Amazing how there is no single shred of this other than post contact accounts from the Frairs who appear to use pre-contact codice Astronomy art depicting acts of sacrifice to support their new fabricated history. One must step back and look at this entire period as a crime scene with a calculated coverup under the watchful hand of the Catholic Church. 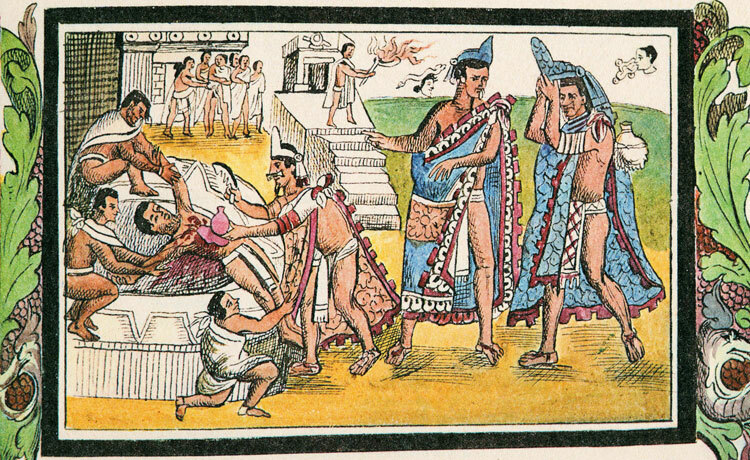 Everyone who took part in re-writing history from oral accounts from this period would be considered a tainted witness on the stand today; including the Mexica children later used as translators. Even this Mexica blog is questionable as to who is funding it and what is the real motive behind the smoke? Mexicolore replies: This ‘Mexica blog’ is totally unfunded!! It’s a labour of love, with no external support from anyone. As for ‘smoke’? What smoke?! I have read several articles on the sun stone and none of them are consistant when it comes to the actual diameter of the stone. For example it is said to be more than 3.5m, 11.75ft, 3.6m, 12 feet. Are these differences because it is not a perfect circle or are they just repeats of previous articles. How big is the calander stone? Mexicolore replies: We’ve answered this question already in our ‘Ask Us’ pages. Click on ‘Ask Us’ in the left-hand menu. I always imagined that this stone was incomplete. Also, I think it would be wise to show a depiction of Tonatiuh and Tlaltecuhtli so people would understand why it could be one or another or a hybrid of both just like Tlaloc is doing the Tlaltecuhtli pose in some art.